…ProWorkflow came from a very basic premise. From our own past and current businesses we learnt that ‘Professionals need Work to Flow‘ and that ‘Projects need Workflow. As its name would suggest, ProWorkflow’s strength lies in its ability to promote better communication and boost efficiency in day-to-day operations. Over the last fourteen years, PWF has been used — mostly by various creative agencies and technology companies — to create over 2,138,547 projects. It is currently employed in 100 different countries, though the majority of users hail from the US and other English-speaking nations. Notable clients include NV Interactive and Australian Unity. Enjoy a free, full-access, 30-day trial of the software - no money down, no credit card number required. ProWorkflow is entirely web-based software and works with the following browsers: Chrome, Firefox, Internet Explorer, and Safari. You can sign up for a free, 14-day trial of PWF, no credit card required, by filling in a few simple pieces of information, including your name and email address. Trials may be extended to 30 days if you find you need more time to evaluate the product. For questions about PWF’s pricing or sales inquiries, you can email the company directly or call for customer service and support (billing questions must be addressed separately to the billing department. All contact information can be located on the company’s website. Upon first logging into your PWF page, a helpful window will walk you through setting your password, adding employees, and adding clients. You also have a chance to load up a sample project rather than starting from a blank canvas. I love practical assistance like this, and frankly, the experience improves from there. Once you go through those steps, you will be taken on a guided feature tour. Tours like this are becoming more and more common in project management software, and I am glad; it is a great way to quickly show new customers how to use a new product, and as a teaching tool it works very well. Once you are through these preliminary steps, you will be faced with PWF’s user interface. Many have critiqued this particular UI in the past (including us in our original review of the product several years ago). Personally, though, I think it has improved greatly with time; in fact, it’s one of the better interfaces I have seen recently. It is well organized with tabs across the top for projects, notes, contacts, and timesheets — there is a “home” button as well. Frankly, I think the homepage (or dashboard) in PWF is one of the best I have seen. It provides a fantastic overview of your open tasks, both written and graphically, as well as showing you how much time you have spent working during the course of a week. It is a good piece of design and very useful for day-to-day operations. So much for the dashboard, but what about the project page, where the actual project management happens? I am pleased to report that it is all roses here as well. Creating a new project is completely painless; you can quickly get one started with minimal details if you like, or fill incomplete information immediately. All you need to do is click the big green “plus” symbol in the upper left corner of the screen. Once you’ve done that, you can add tasks either from scratch or from a template, and then it’s time to get working! And speaking of time, you can keep track of how long you have worked on each task by clicking the stopwatch symbol next to the “time spent” column of the task pane. PWF’s timing features are some of the best in the industry, and better still, they are easy to use as well. Technical Support: For personal, customized assistance, you may fill out a service request on the PWF website’s support page or click the words Contact ProWorkflow Support, found in the top right corner of your account homepage. Like most similar services, this allows you to submit an email request for assistance. When I submitted a request to gauge the response time, I immediately received a confirmation email that they had received my message, with a promise that they would respond within 24 hours. Six hours later I received a response from Shane Liu, head of sales. And their sales department is in New Zealand. For reference, I am writing in the Pacific Northwest of the US. That is excellent response time, and my email conversation with Shane was illuminating, leading to a phone call and much of the information in this section of our review. Webinars: PWF offers a variety of free, live webinars each month, covering almost every topic imaginable, from basic account set-up to time-tracking and advanced user settings. Each webinar is only offered one or two times per month, so it is worthwhile to register early for the ones you’re interested in. Video Tutorials: There are lots of brief video tutorials available on the ProWorkflow website that are useful for learning how to perform small, very specific functions (like how to add new user licenses, or how to customize the look of your UI). These videos are usually so short that they aren’t particularly helpful for gaining a good overview of the software in general, however. If you want to sit down and watch a more comprehensive tutorial, you can check out one of the pre-recorded webinars available on the PWF YouTube channel, or simply sign up for a live tutorial session. Blog: The PWF blog is a good place to look for information about new features, recent updates, and upcoming additions. In general, the blog articles are well-written and contain relevant links, screenshots, and video links. This isn’t the first place I’d look to answer general questions about the software, but it can be a solid resource, especially if you’re just interested in the world of project management. In-App Help Function: On each page of the PWF app (Projects, Settings, Notes, etc.) there is a ? icon which you can click to search for support information specific to that page. On the tasks page, for example, you would find links to articles or video tutorials about tasks and task functions. Helpful Website: Not every company maintains a clean, easy-to-navigate website, but ProWorkflow has succeeded in that area. Apart from clear-cut pricing information and easy access to the support page, there is an excellent features section where you can go to read about all of PWF’s various functions and check out practical screenshots of the app. I highly recommend exploring the PWF website before making any sort of purchasing decision. No Risk Or Issue Management: PWF is a middle-of-the-road project management solution. While more complex than task management tools like Asana and Basecamp, it does not pack quite the punch as some of its competitors when it comes to intricate project planning and issue management. Only Supported In English: Most of PWF’s client base is derived from English-speaking countries, so this isn’t as big of a problem as it could be. Still, it would be nice if down the line the company could add support in other major languages. Reporting Is Clunky: I saw a few people claiming they had difficulty configuring the reporting features in PWF to their needs. This is, however, one of the few complaints about PFW’s usability. In a recent blog post, however, the developers hinted that a reporting overhaul is on its way. Outstanding Customer Support: I encountered many user testimonials during the course of my research, but the one thing every review agreed upon was that PWF has outstanding customer service. Quick, friendly, helpful, and deeply personal, the support staff at PWF has helped to create and maintain lifelong devotees. Customers are passionate about ProWorkflow, perhaps more so than is usual for even the best software program, and it’s because they feel respected, assisted, and heard. User-Friendly Design: PWF is fairly simple and straightforward. All areas are clearly labeled, and each feature is self-explanatory. Even the more intricate functions, like template design, are well within the reach of beginner users. And the customer service is frankly so great (and free) that technical problems aren’t much of a hurdle anyway. Reasonably Priced: For a software solution that charges per user, ProWorkflow is comparatively cost effective, especially when you consider the generous storage space that accompanies each plan. Superior Time Tracking Features: ProWorkflow provides an excellent built-in timer which is reinforced by similarly well-conceived timer and desktop widgets. These tools, along with the ability to manually enter time and keep detailed timesheet records, help businesses maintain accountability with both their clients and employees and increase bookkeeping accuracy. PWF’s practical approach to time management is second only to customer support as its most beloved feature. Or, if you’re interested, check out a few detailed case studies to see how other businesses have utilized PWF. Projects: In PWF, much of the user’s time is spent on the project dashboard, which displays all tasks, messages, time entries, files, quotes, and invoices associated with a project. From this dashboard, you can schedule tasks, edit projects, and manage resources, time, and costs. Additionally, clients who have been given access to the account can directly submit new project requests into the system, which saves time and facilitates better communication. Tasks/Task Management: Each project in ProWorkflow is broken down into one or more tasks. In essence, PWF tasks comprise the basic actions or steps needed to complete the project and can “include start/due dates, allocated times, assigned staff, statuses, file attachments and more.” Tasks are created and managed quickly via the PWF bulk task editor and can be assigned to regular users as well as external clients and contractors. Conveniently, tasks do not always have to belong to a parent project, which means that you can still assign and keep track of random work items (like paying bills, completing payroll, ordering supplies, etc.). The Tasks Page itself is customizable and may be viewed and filtered in a number of different ways depending on how you wish to organize your work (according to due date, status, client, or what have you). Time Tracking/Management: While time can be recorded manually in PWF, each user also has the option to use an excellent built-in stopwatch which automatically tracks and records time on individual tasks. You may also track time with the mobile application or via the Desktop and/or Time Tracker widgets. To further simplify the time tracking process, you can click on the task you wish to record and then drag and drop it onto your timesheet, or even submit multiple time entries at once; these timesheet records are eminently simple to edit and move. Each week, managers and admins can see a concise summary of all the time tracked by users account-wide and then generate, print, and/or export customized timesheet reports (via the ‘Summary’ tab). Timelines: Each project is given a ‘timeline,’ which is PWF’s answer to a standard Gantt chart. The timeline represents tasks and projects as bars (which are color-coded according to status) and then arranges and schedules them along a grid. All work items on the timeline are editable, either by lengthening the bars or moving them, via drag and drop, backward or forward in time. Timelines can be filtered to show only relevant data — just upcoming tasks, for example, or only projects that are overdue — and may be exported or printed for reporting purposes. The Timeline page in ProWorkflow also displays planned resource allocation for your projects and tasks, highlights any potential resource conflicts or issues, and helps you plan projects accordingly. Resource Management: Project managers are kept abreast of resource availability and activity through live alerts about each project and task and are also given the option to check resource availability each time a new work item is created. Additionally, by clicking the ‘Activity > Staff’ tab, managers and admins can see which users are currently logged into PWF as well as what work items those users are currently tracking time on. 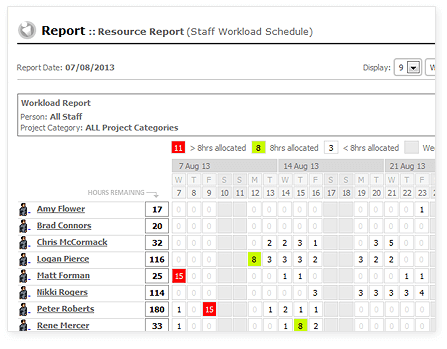 As I mentioned above, basic workload calculations are displayed below the timeline in each project’s detail page, but the ‘Staff Workload Schedule Report’ also shows you the daily allocated hours for each staff member. This report can be filtered according to user and date (day, week, month, or year) and then emailed to outside sources or exported to PDF or Excel. ‘Staff Performance Reports,’ on the other hand, allow you to compare billable hours with non-billable hours, evaluate the difference between the actual amount of time tracked and the time that was allocated, or contrast time tracked against the number of days a user has logged in PWF. Reporting: While ProWorkflow has provided a number of built-in reports just “to get you started,” it also offers a thorough and detailed custom reports builder for those times “when you need more specific information.” The pre-made reports are quite well-designed and cover everything from workload, performance, and resources to quotes, invoices, projects, tasks, and time. If none of the existing reports are adequate for your purposes, the custom reporting features enable you to simply select which data you want to analyze and handcraft your own report. All reports, whether custom or pre-built, can be exported into XML, CSV, and PDF formats, and/or opened up in MS Excel. Quotes & Invoicing: PWF offers a few convenient bonus features that can greatly simplify your quoting and/or invoicing processes. Both the invoicing and quotes plugins have been designed to function similarly so that “when you’ve learnt one, you’ll also know how to use the other.” Quotes and invoices, once created, can be sent directly to clients. You can learn more about these add-on features in the integrations section of this review. Mobile Apps: PWF’s recently re-designed mobile apps are really just mobile versions of their normal page; you will use your mobile browser to access them, rather than downloading from the Apple or Google store. Using this version, you will be able to track your time, create and view projects and tasks, communicate with customers and team members, and more. In addition, the software offers a few free add-ons: a convenient desktop widget (see the Ease of Use section above for more information) and a time tracking widget that uses Adobe Air. There are a few other additions available as well, each for $10 a month, including an invoicing plugin (which works with all of the above integrations) and a unique quotes manager, which allows you to create new quotes and send them directly to clients or export them to XML, CSV, or PDF for archiving or analysis. PWF also provides an open API for those who wish to design their own custom integrations. I can’t really explain quite why I like ProWorkflow quite as much as I do. Maybe it is the brash orange color scheme (they claim they chose the color because oranges are healthy fruits). Maybe it is the clear commitment this company has made to excellent customer service. Maybe it is the sheer usability of this feature-rich software. Any of these reasons would be enough, frankly, to like PFW, but put them all together and you have something special, I think. Maybe part of the reason comes down to company culture. While I was talking to Shane Liu, he laid it out straight for me: “We’re Kiwis.” He told me the key to ProWorkflow is honesty: The goal is to make sales but not at the expense of the customer. If it seems a customer would be better served elsewhere, Shane and his team don’t want to fit their round peg needs into PWF’s square hole. That, more than anything else, makes me respect ProWorkflow. If you are in the market for project management software, I absolutely think this is one for you to consider. Based on the improvements the team has made since our last review, and the comments of long-term users I found online, this is a company that listens to their customers and is committed to making an excellent product. At the very least, you should give the free trial a go and see if PWF is a good fit for you. I don’t want to promise you will like it, but I am pretty sure you will. Excellent review. Thank you. I agree, there is something special about this program.